This tutorial looks at drawing chibi character facial expressions. Chibi characters are highly simplified versions of the anime or manga style drawn with huge heads and tiny bodies. Chibi expressions take the bare minimum needed to convey a certain emotion and can save an artist a lot of time. For this reason they can even be used as “cut-ins” in more serious styles of anime or manga. 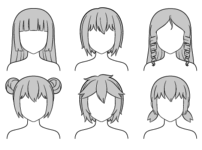 Because there characters are so stylized it’s difficult to have clear guidelines for correctly placing their facial features. For an open chibi mouth you don’t need to draw the jaw lower down like you would in more realistic styles instead the mouth can actually break out of the shape of the head. 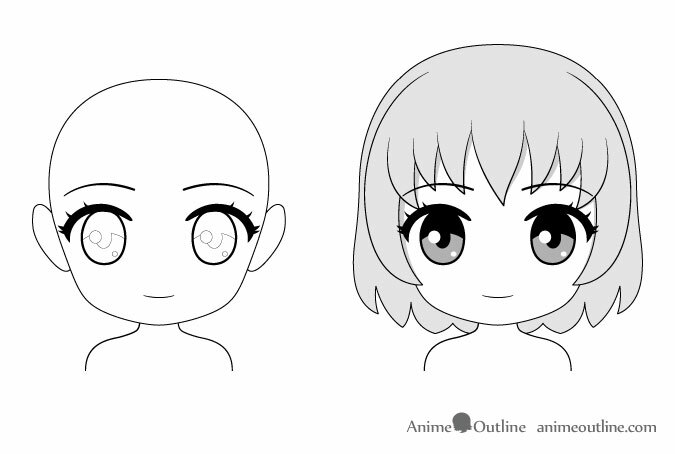 For a normal expression of a chibi anime character draw the eyes pretty much as you would for a regular anime character. 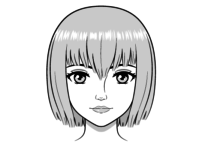 Draw the eyebrows slightly above the eyes and draw the mouth with a light curve. For puppy eyes or begging type of look you can draw the eyes completely black with huge reflections and more of them than normal. Draw the mouth in a downwards curve slightly higher up then normal to indicate that the bottom lip is raised. Draw the eyebrows slightly closer together than normal curving upwards and raised towards the middle of the face. For a slightly nervous chibi expression draw the irises/pupils of the eyes slightly smaller and looking slightly to the side. Draw the eyebrows lightly raised towards the middle of the face and curving upwards. Draw the mouth with a light smile. If you are shading your drawing do not shade the inside of the mouth to indicate that you are seeing the white of the teeth. 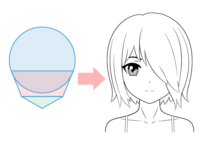 Finally for the real chibi part draw a large drop icon on the upper part of one side of the head to indicate sweat. 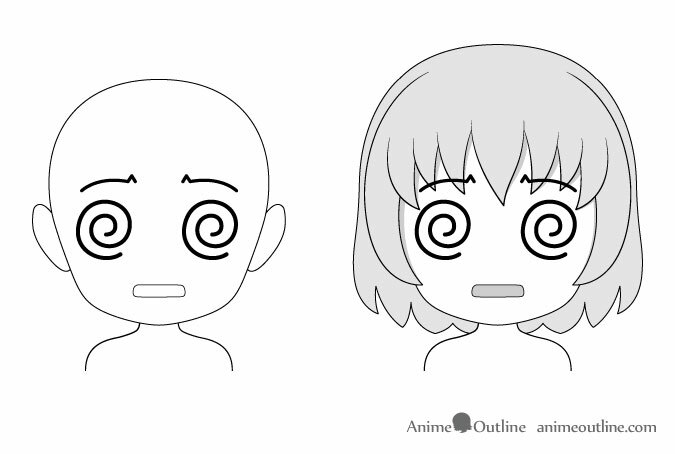 For a very embarrassed or shocked chibi anime expression draw the eyes as two circles with a thick outline (no other details). Draw the eyebrows as two straight lines (thicker than normal expression eyebrows) going downwards towards the middle of the face and lightly touching the eyes. Draw the mouth completely covering the chin all the way to the bottom of the face. The mouth should have a somewhat rectangular shape with curved corners. 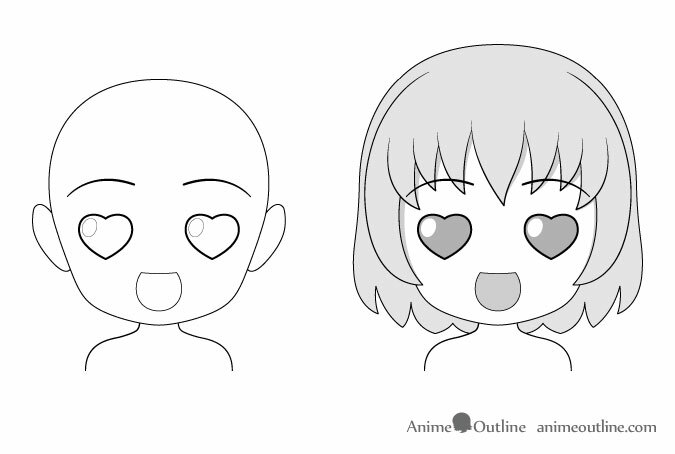 For a “love” expression in the chibi style you can simply draw the eyes with two hearts. Note that this does not necessary have to be love for a person. 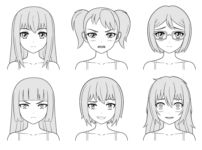 This can be used to show emotion towards anything the characters loves. 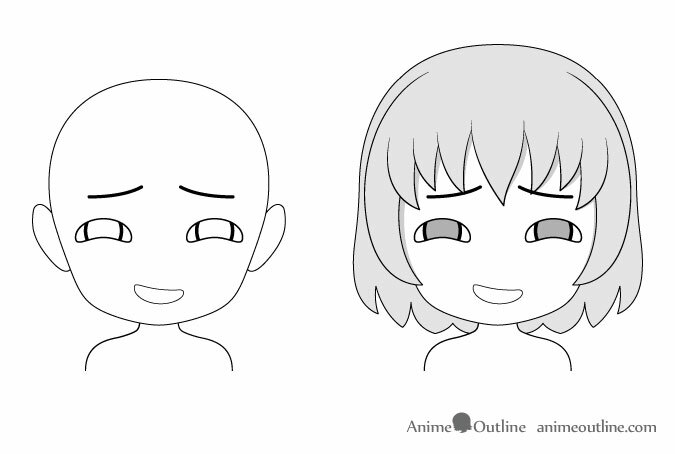 Draw the eyebrows slightly raised and draw the mouth similar to an oval with the top cut off. 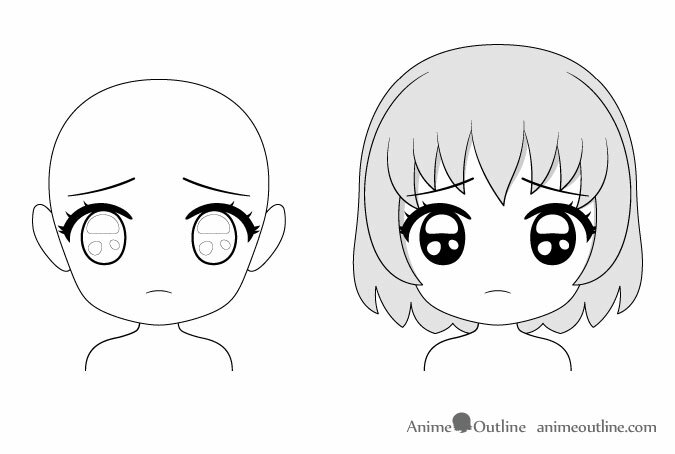 For a really scared chibi expression draw the eyes as two circles with a thick outline and no other details. Draw the eyebrows thicker than normal (no line weight variation) in light upside down curves raised towards the middle of the face. Draw an open mouth that is wider in length than in height. 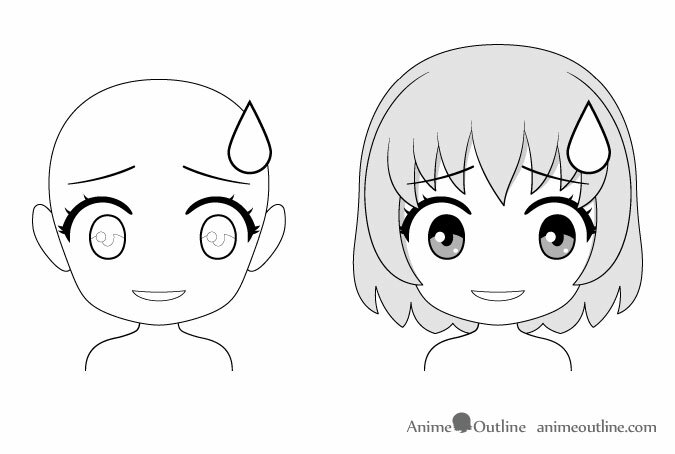 For a ticked off chibi expression draw the eyes as half circles with thick outlines and a thick straight horizontal lines on top of those to indicate the eyelids/eyelashes. Draw the eyebrows as simple straight lines with no line weight variation going down towards the middle of the face. 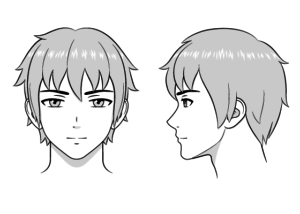 Draw the mouth curving downwards and tilted to one side of the face. For a very angry chibi anime expression draw the eyes as circles with thick outlines but with the top part being slightly cut off by the eyebrows. Draw the eyebrows as fairly thick straight lines angled downwards towards the middle of the face but draw the inner ends of the eyebrows going straight up. the eyebrows should make a kind of “check mark” shape. Draw the mouth wide open going all the way to the bottom of the face and covering the chin. Draw the top of the mouth in a downward curve. Finally to make the expression even more chibi draw a popping vein icon on the forehead. 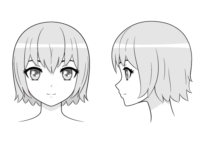 For a content chibi expression draw the eyes completely closed in downwards curves tilted upwards towards the middle of the face. Draw the eyebrows raised and also tilted inwards. Draw the mouth with a light smile. If you are shading don’t shade the inside of the mouth to indicate that teeth are showing. You can also simply draw the same mouth as the normal expression. 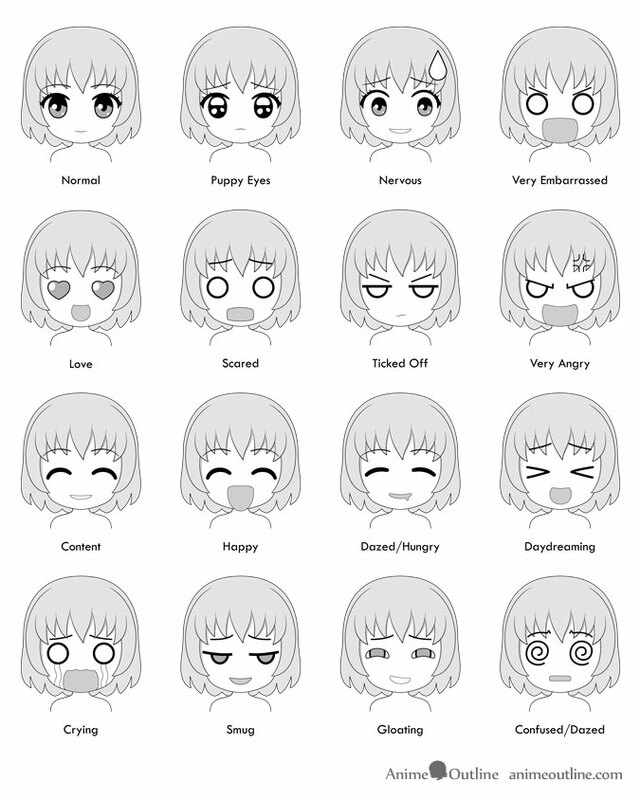 For a happy chibi expression draw the eyes and eyebrows same as you would for the content expression. Draw the mouth close in shape to a half-oval. Draw the bottom of the mouth going past the chin and breaking out of the overall shape of the head. For a hungry or dreaming about food expression draw the eyes closed in slight downwards curves. Draw the eyebrows slightly raised. Draw the mouth slightly open in a curved smile shape but with rounded corners. Finally draw a little drool drip on one side of the mouth. As this is a chibi expression draw the drool drop as if though its merged with the overall shape of the mouth. 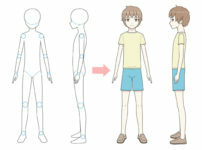 For a daydreaming chibi expression draw the eyes looking like greater and lesser than symbols (“>” and “<“). Draw the eyebrows curved upwards and raised towards the middle of the head. Draw the mouth close to a circle shape but with the top cut off. For a crying really upset chibi expression draw the eyes as two circles with thick outlines and no other details. Draw the eyebrows raised upwards towards the middle of the head with upward curves. Draw tears coming from the eyes all the way to the bottom of the face in a wave like shape. Draw the mouth with a wave shape at the top coming all the way to the bottom of the face and covering the chin. For a smug chibi expression draw the eyes looking slightly to the side as half ovals with thick lines at the top to indicate the eyelids. Draw the eyelid lines curving slightly upwards and angled slightly downwards towards the middle of the face . Draw the eyebrows slightly closer together than normal raised in upwards curves towards the middle of the head. Draw the mouth in a smile shape but shade the inside (if you are shading your drawing). For a gloating anime expression draw the eyes as two “bean like” shapes (curved downwards). Draw the eyebrows same as for the smug expression above. Just like the eyes draw the mouth in a bean like shape. If you are shading leave the inside of the mouth white to indicate that teeth are showing.